Parents and Children, the best part about Gracie Jiu-Jitsu at Scranton MMA is the children are able to learn real world self-defense while “playing” Jiu-Jitsu. These games allow the child master the movements necessary to learn a series of more advanced techniques that they could use to defend themselves against bullies at school. The confidence developed by learning these techniques gives them the ability to prevent fights by standing up to bullies. The BULLYSHIELD™ program will allow your child to play the same games, learn the same techniques, and develop the same confidence that we as instructors have obtained. In addition, you will have the opportunity to earn official Brazilian Jiu-Jitsu belt promotions! Until they are 16 years old, a child remains in the kids’ belt system (grey-white belt, grey belt, yellow-white belt, yellow belt, orange-white belt, orange belt, green-white belt, green belt). At that time, regardless of the belt level, they will graduate to the adult belt system (blue belt, purple belt, brown belt, and black belt). In order to ensure that they are ready to test for blue belt as soon as they turn 16, we recommend that they begin working exclusively on the Gracie Essentials® adult techniques as soon as they turn 13 years old. Upon earning their blue belt, they will move on to the Advanced Cycle® program in which they will learn the 600+ techniques required for promotion to purple belt, brown belt, and, eventually, black belt! Use your journal to track each class your child attends. 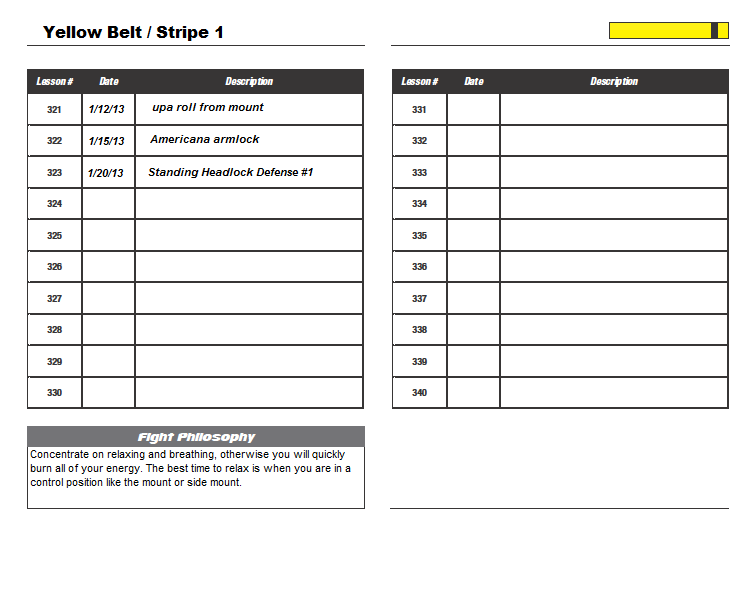 Your child will then be eligible to be rewarded with one stripe on their belt every time they complete 20 classes*. Each time they earn a stripe the date is recorded in the designated box. Once the child has earned all four stripes on their current belt they qualify to test for the next rank. *Please note that a minimum time period of three months is required between stripe promotions. Although it is entirely possible for a child to complete 20 lessons in less than three months’ time this minimum time requirement must be observed. The journey will be long, and the techniques will be many, but, if they don’t give up, we promise they will make it to the top and we will be with them every technique of the way!